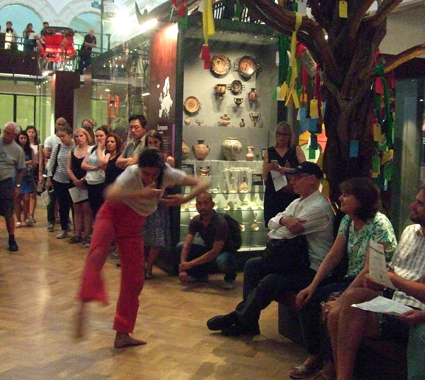 This photo shows a dancer performing in the World Gallery at the Horniman Museum last night as part of its late night opening event - Wonderful World. It was a great evening of talks, entertainment, videos, food and drink - plus a chance to explore all the galleries. I was particularly keen to see the World Gallery, which has only just reopened after being completely revamped. I always loved the displays there as they focused heavily on belief systems around the world. Now it is even better. There are just so many wonderful things in the gallery I want to blog about that I will be doing it over several posts. I will give you just a teaser now by saying there is a whole cabinet full of English magical charms.